The purpose of foundation vents are to control the moisture content of your crawl space so you will not have problems with mildew, rot and other fungus. Also they can exclude insects and other animals that can enter your house. Some people say that energy bills are reduced due to heat ducts being exposed close to open vents. 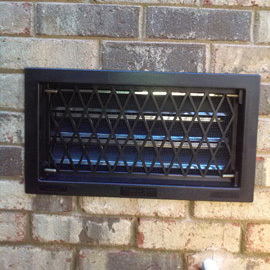 In our opinion, these are the best vents due to it's durability and long-lasting function abilities. Totally open at 78 degrees and closed at 38 degrees to save on energy bills. Double screened to keep out pests. Comes in 2 pieces for customized fitting. Reduces labor in opening and shutting them in seasonal places. Reduces moisture content on wood. 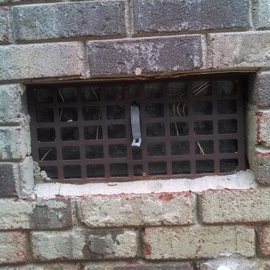 These vents are installed by carefully chipping out mortar or adding depending on the situation of your vent. In some cases we will provide caulk for a finishing touch. The bottom line is we will make sure your vent has an airtight fit and is properly installed. We are so confident that you will be satisfied with these vents that we will guarantee that this vent will function and stay fitted as long as you live in your house or we will replace it for free.